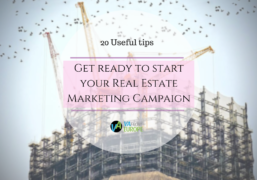 If you’re just starting with real estate business and you have some problems with marketing campaign, the information below will be very helpful for you. 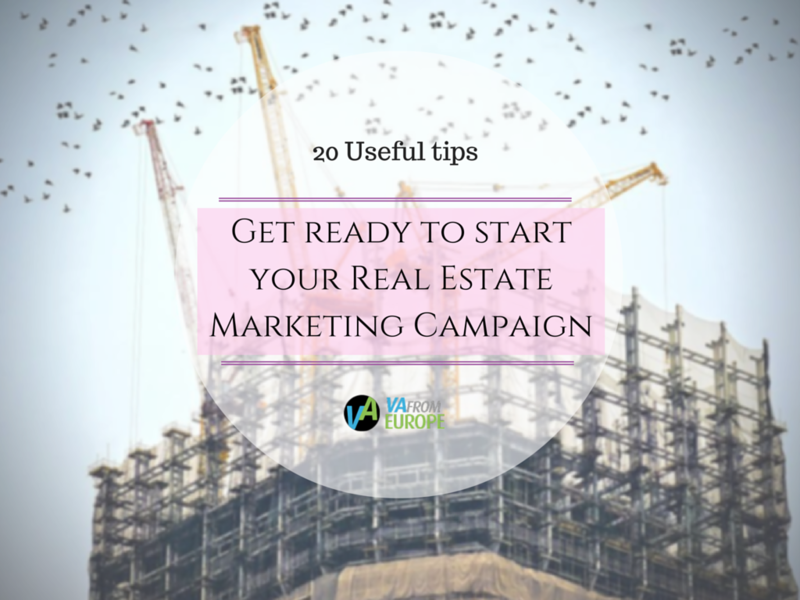 We gathered 20 useful tips and advices on this issue from leading estate professionals! According to the fresh survey of National Association of Realtors 92% of customers searching for the house with the help of the internet. It shows the strong need for real estate business to provide internet platform to represent itself. Zillow has over 130 million visits per month, it is the largest resource in this sphere and it is the best website to start with. Zillow could provide for each spent dollar $2.60 in commissions. Creating listings as a listing agent you’ve got to know, that it’s good for sells to catch the buyer’s attention with descriptions. Interacting customer’s emotions is the effective approach. You need to sell a story, not just words. You have to use each possibility to apply to the customer and to enlarge the engaged audience. Viral video could do this job perfectly. A creative or hilarious clip through shares via social media would work very good for you, even if in the beginning your target group wouldn’t be reached. You’ll never know whether the buyer remembered the agent’s name or fixed the phone number and will call back. Instead of hesitating and thinking of it just make a phone number which could offer all essential information upon the request from a customer immediately in a text message. Don’t be scared to use content from different internet sources, blogs etc., but don’t forget to give links or references to the original source. In this way you won’t waste too much time to create original content regularly but your emails would be still interesting and creative. Speaking about online ads, Google is one of the best platforms to work with! Explore Google Adwords, special tool for advertising from Google. If you want to target the group you defined as your potential customer, for example, old couples more than 50 within your region? There’s a special service Fiverr, where you can hire a professional for $5 to help you to arrange ads on Facebook. Drip marketing emails are messages written beforehand that get sent automatically to your buyers. They help you to establish a relationship and guide clients through the sales path. When you understood the necessity of a drip email campaign, you’ve got to know how to arrange it properly. A strong subject line of your emails is the most important thing. The next important thing is to include a call-to-action that prompts engagement. Open Houses is an effective thing to foster your business. Leads like to look around inside the house, to see what’s there in a distressful way, without any difficulties for them. Open Houses should become your plus point, let buyers sign up with your devices or laptop. Use email addresses as a symbolic payment for the registration and send them the latest list of homes for sell in the neighborhood. Real estate marketing postcards sent on a regular basis can improve prompted brand awareness, raise interest of the masses to your business. If you want to try postcard marketing, visit the PostcardMania resource, it provides useful tools specifically for real estate business. Every day many people buy and sell houses on Facebook. There is no commissions on Facebook, no fees, in addition any real estate realtor can use it. Until there is no shopping service of the immediate and direct purchase, Facebook offers the interaction of leads and brokers that could work well. In advance, you can do it for free! Write thankful notes! In our age of technologies, it seems to sound strange, but because of it people appreciate such notes more than you may think. Buyers highly estimate hand-written letters and thankful notes, because you spent more time and work for it. Not many people are doing this. In real estate business, you’ve got to take any advantage you can! for this purpose and you’ll forget all the headaches considering this case. It would definitely save your time. This practice is old, but useful. Make door hangers as a part of your marketing campaign. Your leads wouldn’t ignore it, probably they would take the advertisements home. Door hangers would catch their attention and mind longer than, for example, an email. Pinterest is a huge social media platform. It works better than Facebook, because it consists of the visual material, and it’s easier to create a beautiful story to sell for the masses. Pinterest could provide a good connection with your potential clients, because you can offer some visual response. Your brand awareness depends upon your Real Estate Slogan. Your slogan will tell your leads what your business is. Nice slogan have to stick to the memory of a customer and define a tone of your business. Home research online becoming more and more popular. It doesn’t mean that your potential customer will buy a house without seeing a home with own eyes, but first staging points were replaced to the internet. Some customers want to choose a neighborhood before seeing a house. That’s why neighborhood description is very important. If you want to raise your sells rate, the good thing is to apply testimonials successfully to help to earn confidence of your potential buyers. It’s hard to imagine more positive thing to influence the mind of the potential client than a third party recommendations of your work from someone who has already done business with you. Sometimes that’s all you need to persuade someone to sign the contract with you. According to the statistics, during the weekend 59 % of users visit real estate websites with smartphones and tablets. Despite that fact, real estate agents do not hurry to develop their websites for smart viewing. Spend more money on your website to get more profit of it! Fully furnishing of your listing proposals is highly recommended. Offer the potential customer the furnishings as part of the contract. It can be used as a reason to sell the house with the offering of the turn key solution, that’s a good thing! Kick the tires and light the fires, problem is solved!